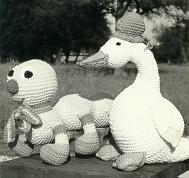 Easy to Crochet Patterns from Charles Publishing! Toys for all ages! Over 250 patterns available at $2 per pattern. Koala Bear, Circus Pony, Clown, Hippopotamus, Tyrannosaurus, Stegosaurus, Panda Bear, Hand Puppets, Coyote, Roadrunner, Flying Saucer and Spacemen, Robot, Peggy Piggy, Dachshund, Baby Elephant, Ginny Giraffe, Kangaroo, Choo-Choo Train, Raccoon, Armadillo, Three Owls, Leggy Rainbow Caterpillar, Tommy Turtle. Country Goose, Country Mouse, Grandmother�s Doll, Unicorn, Kewpie Doll, Country Bunny, Country Cow, Calico Cat, Sleepy Baby, Flower Skunk, Indian Boy, Indian Girl. 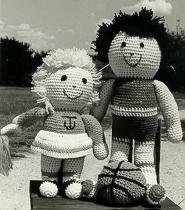 Crochet Sports Toys: Football Quarterback, Cheerleader, Baseball Player, Basketball Player and Cowboy! Seasonal Crochet Patterns: Santa Claus, Snowmen, Nativity Scene, Tree Ornaments, Christmas Stockings, Wreath, Tree Skirt, Easter Bunny, Wendy Witch, Scarecrow and many more!